In China, lower-tier cities are challenging the dominance of first-tier cities like Beijing and Shanghai for attracting foreign investment. In recent years, the increasing cost of labor, housing, and land in first-tier cities has led many Fortune 500 companies — especially those in the computer, software, information technology, and e-commerce sectors — to settle in second- and third-tier cities. Lower-tier cities are continuously announcing business incentives to attract investment and promote pillar industries, while also offering a variety of entrepreneurship and housing subsidies to attract talent. China’s next generation of workers are aware of these trends. According to the 2018 Research Report on the Employment Market for Graduates, 40 percent of the 90,000 graduates surveyed hope to work in so-called “emerging first-tier cities” such as Chengdu, Hangzhou, and Chongqing, while only 27 percent hope to work in first-tier cities. To understand how these lower-tier cities are performing compared to established first-tier cities and to identify those with the greatest economic potential, China Briefing examined all cities in mainland China with a gross domestic product (GDP) of more than RMB 500 billion (US$74.1 billion) in 2017 and calculated their GDP growth rates between 2012 and 2017. 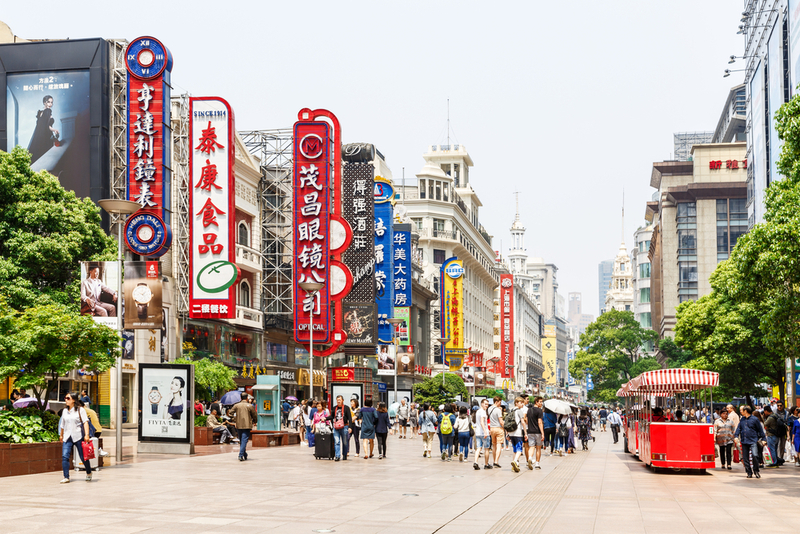 In this article, we examine the business environment and latest developments in the top five fastest growing cities in China. Hefei is the fastest growing city in China, with its GDP rising from RMB 416.4 billion (US$65.9 billion) in 2012 to RMB 721.3 billion (US$106.8 billion) in 2017 – an increase of 73.2 percent. A survey by the State Administration of Foreign Experts Affairs titled ‘2017 Charming China’, revealed that Hefei was the third most attractive Chinese city in the eyes of foreign talent, placing just behind Shanghai and Beijing. The city currently has eight core industries: automotive, equipment manufacturing, home appliances, chemicals, new materials, software and electronic information, biomedicine, and food processing. Last year, Hefei was selected as a pilot city under the Made in China 2025 initiative, and as a result increased its investment in the manufacturing sector. To this end, in June 2018, Hefei announced subsidies of up to RMB 20 million (US$3 million) to eligible newly settled businesses in the circuit and software industries to promote investment in both these sectors. Further, Hefei has ramped up efforts in targeting Fortune Global 500 companies in the equipment manufacturing, new energy vehicles, and logistics sectors in order to attract more foreign businesses and high-end human resources. The city has also committed to improve incentives targeting overseas professionals. Earlier, in 2014, Hefei launched a system to promote industry development, introducing five specific measures to advance industrialization, innovation, agriculture, services, and culture. By 2020, Hefei aims to realize a GDP of more than RMB 1 trillion (US$150.9 billion). Ranked as the second fastest growing city, Yangzhou’s GDP rose from RMB 293.3 billion (US$46.4 billion) in 2012 to RMB 506.4 billion (US$75 billion) in 2017, an increase of 72.65 percent. Traditionally, the dominant industries in Yangzhou have been automobile, machinery, tourism, software, and food processing. In 2017, the city released plans to strengthen strategic emerging industries such as new energy, new medicine, novel materials, energy conservation, high-end manufacturing, information technology, and biotechnology. The objective is to generate an output value of RMB 700 billion (US$105.6 billion) from these industries by 2020. Furthermore, Yangzhou is the bedrock of the software and information service industry in Jiangsu. Accordingly, analysts acknowledge that the city is well-positioned to influence regional industry development and industrial transformation. In April 2018, the government announced generous incentives to attract high-end professionals, including a monthly rental allowance of up to RMB 3,000 (US$452.10) and a one-time housing subsidy worth up to RMB 2 million (US$ 301,390). Yangzhou is also the only city in Jiangsu province to be awarded “pioneer” status as a result of its support for small and micro-enterprises. Yangzhou, acknowledged as a highly livable city, is likely to continue its progression of economic growth and talent retention, as it continues to stimulate its economy through innovation and industry expert input. Shenzhen is the only first tier city that continues to expand at a country-leading pace. The city has seen GDP growth of 72.1 percent from 2012 to 2017, rising from RMB 1,295 billion (US$205.1 billion) to RMB 2,228.6 billion (US$330.1 billion). For the first time, Shenzhen has overtaken Guangzhou to become the city with the third-highest GDP in mainland China in 2017, behind only Shanghai and Beijing. As the fastest growing first-tier city and the most successful special economic zone, Shenzhen owes its success in part to its proximity to Hong Kong. Shenzhen’s pillar industries are the cultural and creative industries, high and new technology industries, modern logistics, and finance. In the future, the government will focus on developing emerging industries, including new energy and materials, life and health, robotics, intelligence equipment, and aerospace and aviation. In recent years, the secondary (manufacturing) sector has received increased attention so as to avoid industrial hollowing-out due to the relocation of manufacturing caused by rising production costs. Shenzhen is also known for its dynamic and booming startup scene. Unlike Beijing and Shanghai, which have more state-owned enterprises, Shenzhen is home to younger, private companies. In 2016, Shenzhen had the highest density of startups of all the mainland cities. The government plays an important role in promoting these companies by providing abundant resources and funds for entrepreneurs to invest in the various sectors. For example, qualified leading e-commerce enterprises setting up headquarters in Shenzhen may be awarded RMB 5 million (US$748,875.0), while qualified individuals or teams who establish startups may be awarded up to RMB 1 million (US$150,690.0). In addition, in June, the city announced housing policies that provide qualified Chinese citizens with substantial subsidies for renting or buying a home. The drawbacks of doing business in Shenzhen is that the monthly cost of living is relatively high – an average of RMB 7,000 (US$1,056.2) – meaning that land and labor is expensive. Chengdu’s GDP grew from RMB 813.8 billion (US$137.1 billion) in 2012 to RMB 1,388.9 billion (US$205.7 billion) in 2017, amounting to a 70.66 percent increase. In late 2017, Chengdu announced that by focusing on six aspects of the new economy (digital, intelligence, green, creative, mobile, and shared), it aims to reach a new-economy output value of RMB 500 million (US$75.4 million) by 2022. Analysts believe that Chengdu is a strong candidate for developing the new economy because of its many comparative advantages, including being a logistics hub for the Belt and Road Initiative, boasting a huge consumer market, having abundant scientific and technological talents, and being a highly livable city. However, some observers argue that Chengdu’s new economy is currently still capital intensive and lacks innovative capabilities. The government has also rolled out key measures to support new economy-related companies, including the establishment of an RMB 10 billion (US$1.5 billion) new-economy development fund and subsidies of up to RMB 40 million (US$6.0 million) for financial institutions and their headquarters that are newly-established in Chengdu. In addition, this year, the city introduced a series of measures to further attract foreign investment. If the regional headquarters of newly registered multinational corporations (MNCs) are located in Chengdu for at least a year, they can receive establishment funds of up to RMB 500 million (US$75.4 million). Chengdu’s continuous efforts to attract investment have proven fruitful. According to Yicai’s 2018 Business Attractiveness of Chinese Cities Ranking, Chengdu is the most attractive emerging first-tier city for businesses in China, ranking at the top in its concentration of commercial resources, the vitality of its people, its urban pivot ability, and urban plasticity. Nantong’s GDP grew from RMB 455.8 billion (US$ 72.2 billion) in 2012 to RMB 773.4 billion (US$ 114.5 billion) in 2017, representing a growth rate of 69.67 percent. Nantong continues to develop its mainstay industries – such as high-end textiles, electronic information, and marine engineering – while nurturing the development of emerging industries, including intelligent equipment, new materials, new energy, and new-energy vehicles. Located on the Yangtze River Delta, Nantong has fostered greater cooperation with other cities in the region, especially Shanghai. In 2017, the government published details of a strategic policy aimed at escalating the construction and development of Nantong, which will improve its integration with surrounding areas. By integrating and collaborating with Shanghai’s capital, technology, and human resources, Nantong aims to become the economic and transportation hub of the north wing of the Yangtze River Delta. The two cities complement each other: Nantong utilizes Shanghai’s resources to accelerate industry innovation and transformation; while Shanghai expands its market share and advances industry development through Nantong. Nantong offers generous subsidies to attract top-end talent. Nevertheless, the measures taken to attract graduates and youth are proving ineffective. This was reflected in the 2017 China Urban Research Report, released byBaidu Map, which revealed that Nantong’s ranking in terms of attractiveness to the urban population has steadily dropped. In recognition of this, a city official announced in June that developing Nantong as an innovative city that appeals to young professionals is a priority. Analysts pointed out that it is vital to deliver what matters most to potential residents, particularly a housing and cost-of-living subsidy, a reduction of hukou restrictions, and opportunities for career development. Aside from government support, the driving forces behind the five cities’ are strongly related to their location and their efforts to join China’s macroeconomic trends to innovate pillar industries. In our ranking, three of the five cities are located in the Yangtze River Delta, and one is in the Pearl River Delta. The government has been creating city clusters and super-regions to facilitate urbanization, which may be positively correlated with GDP growth. Notably absent from the list are cities from northern China, where much of the economy is struggling compared to China’s dynamic eastern and southern regions and booming west. The rise of lower-tier cities has also brought huge investment opportunities in the daily consumption, education, and elder care markets. Consumption growth in second-, third-, and fourth-tier cities is nearly 1.5 times larger than that of first-tier cities, according to the 2017 Consumption Upgrade Big Data Report. However, some analysts claim that, for the short term, second- and third-tier cities will continue to suffer from talent and capital disadvantages over emerging and first-tier cities, which have more abundant cash flows. Nevertheless, as the government continues to restrict population growth in first-tier cites, many businesses and talented individuals may still choose to settle in lower-tier cities as they continue to offer lower living costs and a variety of investment incentives. For inquiries, please email us at china@dezshira.com. Further information about our firm can be found at: www.dezshira.com.